European Union foreign policy chief Federica Mogherini and French Foreign Minister Laurent Fabius are both in Iran, discussing implementation of the July 14 nuclear agreement between Tehran and the 5+1 Powers. 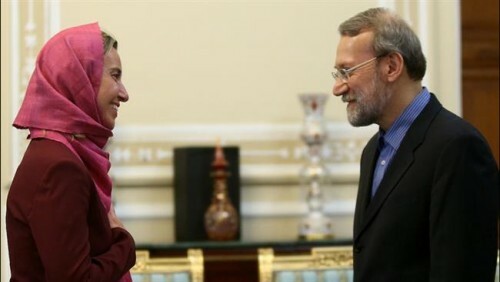 Mogherini and senior Iranian officials spoke on Tuesday of cooperation beyond the nuclear deal, reached after more than a decade of tension and negotiations. Mogherini told the BBC that the completion of the deal had shown that dialogue could succeed in difficult times, while cautioning that the implementation of the agreement would be just as challenging. I, on behalf of the European Union, say that we stand fully united and committed in supporting this agreement and I, as a member of the joint commission, will make my utmost effort to monitor the correct, precise and prompt implementation of every step of this agreement. If the nuclear agreement is approved [by the Iranian Parliament], Iran will be committed to the terms of the agreement and will carefully implement it, but if the Iranian nation feels that the 5+1 Powers are not making good on their obligations under the agreement, the tables will be turned. Foreign Minister Mohammad Javad Zarif Zarif said that “high-level talks” with the EU will focus on energy, trade, environment, human rights, and the fight against drugs as well as regional issues. 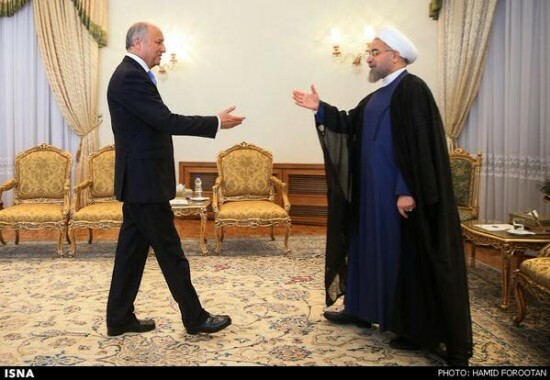 Fabius arrived on Wednesday morning for discussions with President Rouhani, Zarif, and other Ministers. The visit is the first by a French foreign minister to Iran in 12 years. While Fabius also referred to the implementation of the nuclear deal, his visit may be just as important for economic ties, as he told Rouhani that a French trade delegation will travel to Iran in September. We had good talks today on pursuing (the promotion of) our bilateral ties…. Once the JCPOA [nuclear deal] takes effect, the grounds will be ready for further cooperation in different fields including energy, transportation, and car manufacturing, where the two countries have traditionally had extensive relations. Oil Minister Bijan Zanganeh, after meeting Fabius, said that Iran will enter into “a new chapter of cooperation” with French energy company Total. PreviousSyria Daily, July 29: Regime Collapses in Northwest — Did Assad Give Up?